Otterhounds were used to hunt river otter in the late 18th century as a way to keep overpopulated otters from destroying much needed food sources. Queen Elizabeth I was the first "Lady Master of Otterhounds". Currently, there are less than 1000 Otterhounds worldwide with approximately 350 Otterhounds living in the US and Canada. 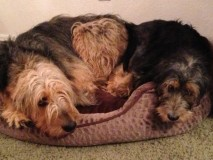 Otterhounds are excellent family companions with great sense of humor and friendly personality. Otterhounds excel at essentially any activity where they can follow their nose such as scent work and tracking. They also enjoy conformation, agility, rally, coursing and obedience. They are trained as Search & Rescue and Therapy dogs. They are also very skilled at laying around being a hound! The Otterhound is a large, strong breed with a considerable size variation. Otterhound puppies typically go home around 8 week of age and weigh approximately 20 lbs. As adults, females weigh between 75-90 lbs while males tip the scales at 100-125 lbs. The Otterhound body is slightly rectangular in length with strongly boned legs and broad muscles. A course and crisp outer coat is present with a woolly, water repellent undercoat. The head is large and imposing with long, pendulous, low-set ears. Otterhounds have a deep, melodious voice and will happily “sing” with other hounds and with people!